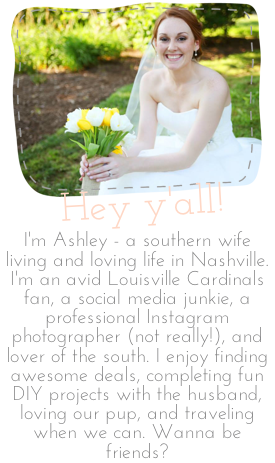 The Sweet Ashley Life: March Madness, anyone? Is anyone else enjoying a leisurely selection Sunday? Yes, I am a grown woman, but I am beyond excited about March Madness!! We have been glued to the games over the past few days, and thank goodness because we caught some good action! Yup, we are this year's Big East tournament champions! I am so proud to be a Cardinal fan! Did you watch any basketball this weekend? How did your favorite teams do?? While we did spend a lot of time watching basketball, we also did a few other fun things. Friday we went out to the local farmer's market (which is large, and has events throughout the month)--they have a Meet'N 3 event each month that involves local music, vendors, meeting locals, and [the best part] local food trucks. 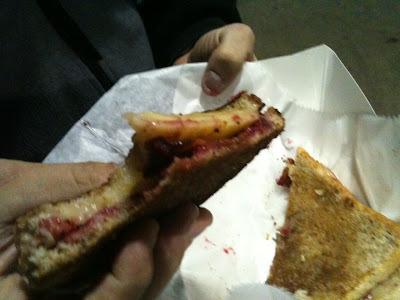 We had been dying to try the Grilled Cheeserie, so we were happy we finally had a chance to sample the menu! We didn't try any of the other truck's offerings, because we had other plans for dinner, but we did check out the rest of the menus while we were there. After our tasty appetizer, we headed further downtown for dinner. I had a craving for sushi [what's new?? ], so we went to a small local place, Wild Wasabi. It was our first time there, but I hope we go back soon! We also tried out a new [to me] coffee shop as well. It had a lot of character and reminded me of my favorite coffee shop in Louisville. Isn't she pretty? At a whopping $7, she's my most recent favorite steal! The weather was AMAZING this weekend, so we took advantage of it and spent Saturday afternoon at the part. After playing frisbee, football, and taking a hike we decided it was the perfect time for some Las Paletas. Even though we went for popsicles, I couldn't resist getting some ice cream instead. Lucky me, the boy got a yummy pineapple blueberry popsicle, so I was able to try both! Peanut butter, banana, and honey. The boy makes a mean sandwich! Do you get it? Ha! P.s. Proof that we drink coffee at all hours of the day...it's almost 9 on Sunday night and I'm drinking some from my favorite mug as I type this! What did you do this weekend? I'm sure I tried enough new food for all of us, but did you have a chance to try anything new? I am seriously dying to spend a night eating from food trucks... is that weird to admit? And CUTE blazer! What an amazing deal you found! LOVE peanut butter and naner sandwiches. That blazer is awesome! Totally understand from a fellow thrifter. Oh I need sushi. Hahaha I could NOT drink coffee at 9PM at night. I'm also jealous of all the deliciousness you at this weekend, AND I've been playing draw something too! It's addicting! 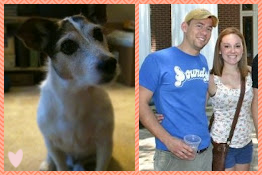 stumbled onto your blog and just wanted to leave you a little blog luv! Def enjoyed reading this post! !i LOVE LOVE LOVE march madness! i actually have them in the elite 8 in one of my brackets! !